R.R. 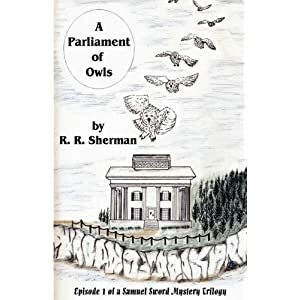 Sherman’s A Parliament of Owls is the first installment in what promises to be an absolutely riveting series, The Samuel Sword Mystery Trilogy. This page-turning story of archaeologist, astronomer, and attorney, Samuel Sword, will keep readers riveted from cover to cover. Sherman’s prowess for suspense is clear from the first page, opening with a murder trial on which Sword is working, the conclusion of which immediately segues into a nail-biting story involving his legal assistant and investigator, Crystal Cross, who witnesses a grotesque murder on her way home from a dance club. Sherman has a gift for teasing his readers, offering them a brief chapter on an inexplicable murder and then pursuing other storylines while the reader anxiously clamors after the details and conclusion of the subplots. As the murders pile up, it all appears to be some kind of “big jigsaw puzzle” for which there is no clear answer; “We have all the pieces that surround a hidden picture, but we are lacking those in the middle.” Tensions mount as Samuel Sword and a group of wedding guests are stranded at a privately owned island twenty miles away from Eastern Cape Cod, as the winter weather turns vicious, stopping all transportation to and from the island, and several guests failing to arrive. A Parliament of Owls is yet another captivating offering from R.R. Sherman, the author of The U.S. Supreme Court: The First Hundred Years and In the Right Place at the Right Time: Twenty-Six Prominent Americans , proving that, as he enters a new genre, he has an undeniable prowess for fiction. Using his social awareness and knowledge of history honed in his previous books, the final implications of the book are far-reaching and socially significant. To be sure, Sherman keeps readers on the edges of their seats throughout this spellbinding story that concludes with a shocking and unsettling denouement, inevitably leaving all anxious for the next installment of the Samuel Sword Mystery Trilogy, A Murder of Crows. Though this book was short, it was packed from beginning to end with suspense. From the first few pages I could tell that I would be pulled into this story! I think a lot of this is due to the well developed characters within the book. I have to say up front that the lead character is definitely one that is reminiscent of James Bond (in at least some ways in my opinion). The main character Sword is one that you are drawn to and you want to see what will happen to the character next. The book is full of murders that are left to be solved. The author is a master at setting up puzzles and he allows the reader to only get so far before he lets the reader in on further clues, thus the suspense continues to build! The book is not only an engaging read, it also informs your own knowledge on many areas. The author uses his intellect and knowledge to make the reading more than just a fun read, but instead a book that educates and entertains (it's nice to have such a nice balance).